BrandonClayScouting.com is the industry leader in excellent college essays talent identification. We specialize in elite level reports for four-year colleges and universities. 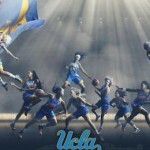 Class of 2015 prospect Ashley Hearn of Rowlett, Texas chose UCLA earlier in the year. She was recruited by the majority of the major programs nationwide. We explore what the four-star plus prospect brings to coach Cori Close and the Bruins starting next year. Hearn has a great frame and great tools. Right now, she doesn’t complete the high 50 plus percentage of plays at the rim that you would like to see from a player of her talent. In this way, she reminds me of Caliya Robinson (GA-15). Both are uber talented but still putting it all together. Hearn has good size and is strong though lean through her arms. She played a combo 4/5 role here during the Trials battling at times with the top posts here Kalani Brown (LA-15). Hearn is a consistent option based on my three viewings this spring. Hearn’s footwork in-game seems to have improved. Her size and willingness to compete have always been there. 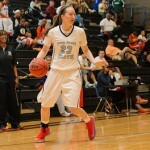 She’s rounding out into one of the top 5-7 combo post options in the class nationally. Hearn has good size. She came here from USA Trials to play with DFW. Her production here was just okay in a matchup versus the Cal Ballaz. When she’s not at her full activity level, she struggles to be effective. Her calling card is her energy and willingness to rebound. We came away impressed with Hearn and her dedication to the game. She was the first player in the gym all weekend long and often times the last person to leave. She has five player size and four player mobility. You can play her as a true post or let her float on the perimeter as an athletic Brooklyn Pope type four player. Right now her skill set isn’t refined enough for you to run a high dosage of the offense through her on the blocks, but she is an active presence who will find ways to be effective. Hearn has an incredible wing span. She was playing primarily in the lane today while showing that she could step out and face up in the future. She is very active. Hearn is working hard in ball handling drills. In that way, I like her willingness to get better. She turned around and did the same thing in post drills. 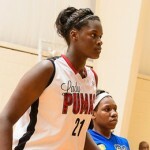 She is still just scratching the surface of being skilled with plenty of upside. Even though she saw limited minutes here, it’s easy to tell that she is very talented. Is still learning the game and how to be effective. Great upside. 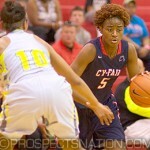 Just two weeks later, she played the 4 spot next to Teaira McCowan (TX-15). Wow, like airplanes standing side by side. Hearn is a good athlete with a prototype 4/5 frame. Long, rangy. 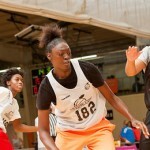 Reminds me of a young Tiffany Jackson (WNBA) with her build/length/willingness to run. That said Hearn is not as good a scorer as T-Jack was this early. Hearn displayed a nice release and touch around the essays on the scarlet letter rim. 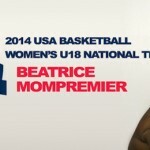 Main takeaway: amazing size for her age and will run the floor. She changes shoots with her length even in Super Elite Division (2012/13 grads). Right now, she is learning how to score especially against the older post play meaning there is nothing but upside! Blessed with great size already, Hearn will need to continue to learn how to play the game. In time, we expect her to develop her back to the basket skill set.